HeatGear fabric is ultra-soft & smooth for extreme comfort with very little weight. UPF 30+ protects your skin from the sun's harmful rays. 4-way stretch construction moves better in every direction. Material wicks sweat & dries really fast. Anti-odor technology prevents the growth of odor-causing microbes. 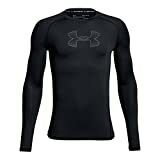 Interested in the Under Armour Boys' HeatGear Armour Long Sleeve, Black (002)/Graphite, Youth Medium? Is the price too high? You can easily price watch this product and we'll notify you when the price reaches your target.